Indoor racing is always an exciting time, especially for Irish athletes, as its time to get a break from the outdoor elements and boy did we have a tough winter of wind and rain. Coach Rodgers and I planned a short indoor season as the main focus is getting to that start line in Rio come August, and well it’s still a long way away. 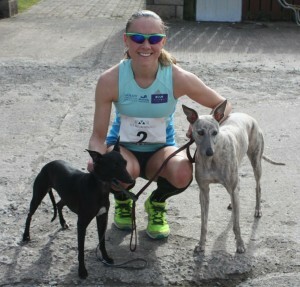 Three races were planned, two 3000m and one 1500m, but if I had my way it would be 1500m all the way, I just love it. But the focus this winter had been to further develop my endurance and being a bit of a lactic animal the more 1500s I do the more my anaerobic system likes to dominate and the focus is to protect and build my aerobic capacity for that last km in the steeplechase. 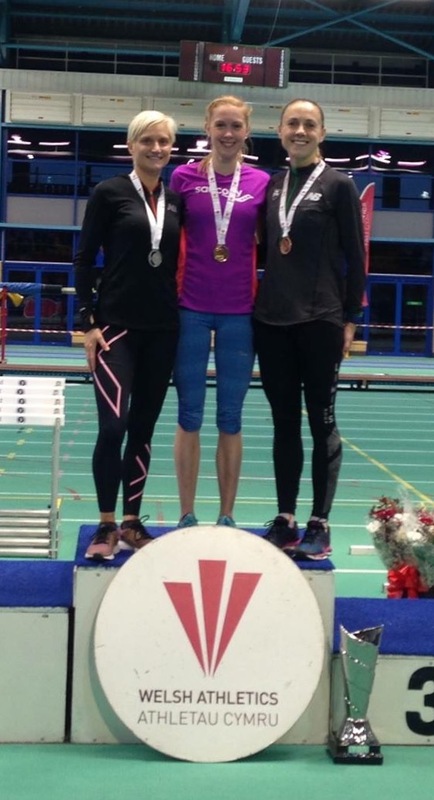 The first 3000m was in Cardiff at the Welsh Championships, I picked up a bronze medal and ran 9:30 which I was very disappointed with as I knew I could run faster. The first two kms were going well and then I just felt drained on the final km. I came away from the race questioning my training as I had been working on my endurance until the cows came home, so what went wrong? When you’re running well in training and then a race doesn’t go your way you question so many things and who gets the brunt – the coach. So coach Rodgers got 101 questions down the phone on my way home from Cardiff. 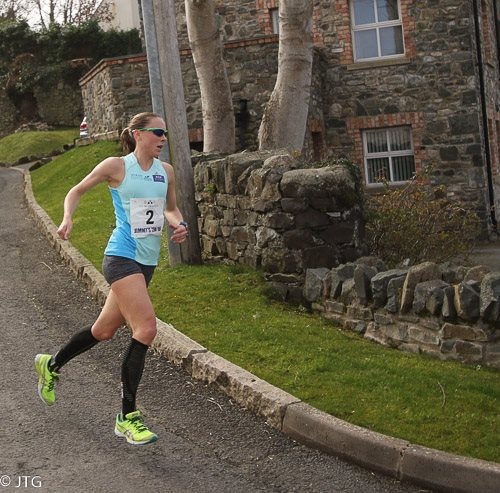 Ok I hadn’t fully tapered but I wasn’t sick, I felt fresh after – in fact I didn’t feel I had raced at all as I didn’t have that burning throat or cough that I tend to get after a hard indoor race, so what did go wrong? 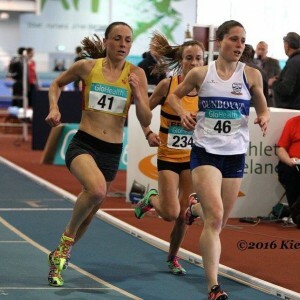 I had just finished a longer than normal cross country season and stepping onto a tight indoor track (200m) after racing on the country since November could be the answer – but I wasn’t taking any of that. 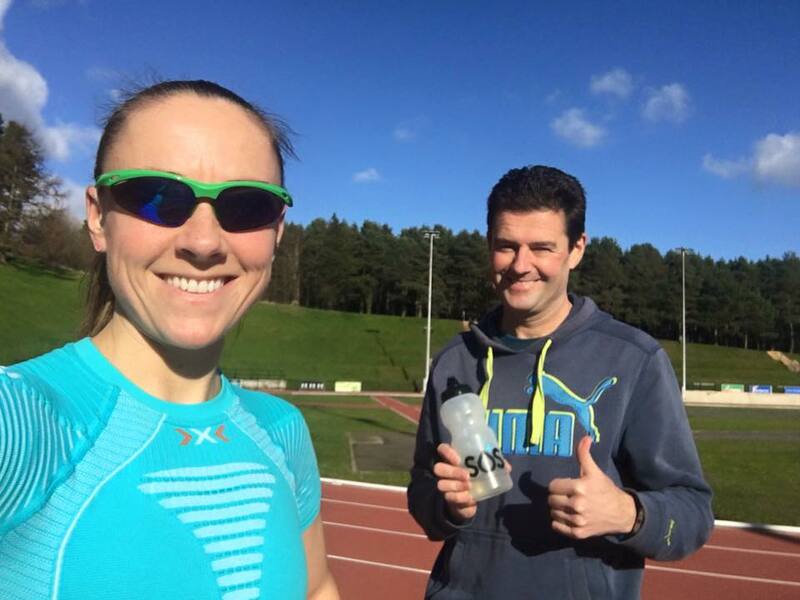 I actually hadn’t run any specific track sessions prior to Cardiff, all the hard work had been done on the road or in the forest. Coach said it was only a matter of adding in a couple of specific track sessions and the races would take care of the rest. It was three weeks to the National Championships with a couple of back to back races in the middle. 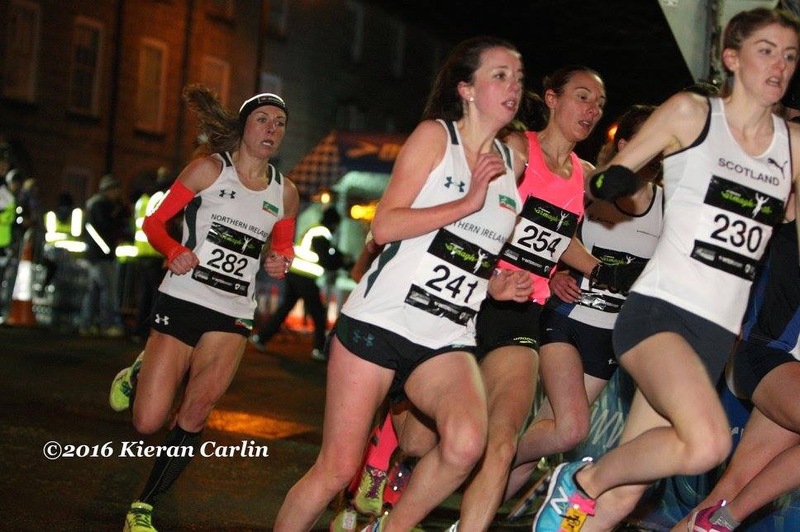 The Armagh International Road Race over 3k is always a favourite of mine but it was the evening after the AIT Indoor International were I was determined to run a good 1500m after my disappointment in Cardiff. So we looked at things and decided to run them both treating them like a semi-final and a final which I rarely get the chance to do but it could be something I may need to do this summer on the track in the steeplechase at the European’s all being well. 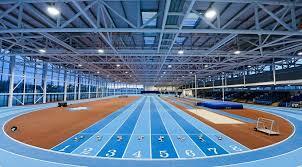 So with only one key track session done for the 1500m I was confident I could run well as although it had been a while (5months) since I had trained on a track the session had gone smoothly and I really enjoyed what was a tough enough session of 16x300m!!! The AIT International has become a worldwide popular meeting in only a few years taking place as it does in a world class indoor athletics facility. The line up was to be the best ever 1500m I had ever run. It was fast from the gun but I hung in at the back and used my strength to run a fast last 600m pulling through to finish 9th. I was delighted to run what was my second fastest 1500 indoors ever (4:16.3) and even more delighted for my training partner and friend Rose-Anne Galligan who ran a PB of 4.11 qualifying her for the Indoor World Champs the following month. Exactly 24 hours later I lined up in Armagh, a little worried my legs just wouldn’t feel that fresh. Again the line up was the best there has been ever in the women’s race in terms of depth – maybe 20 different women could win on the night. After the cavalry charge at the start, I got a little boxed in but stayed calm and made my way through when I could. The first km was steady and by the bell it really wound up with Charlene Thomas (1500m specialist) hitting the front, there was a pack of around 15 of us all, running what felt like sprinting the last km. The legs did feel a little heavy but they were clipping along fine, turning the last corner I was passing people and in the last 200m I was still gaining some ground. 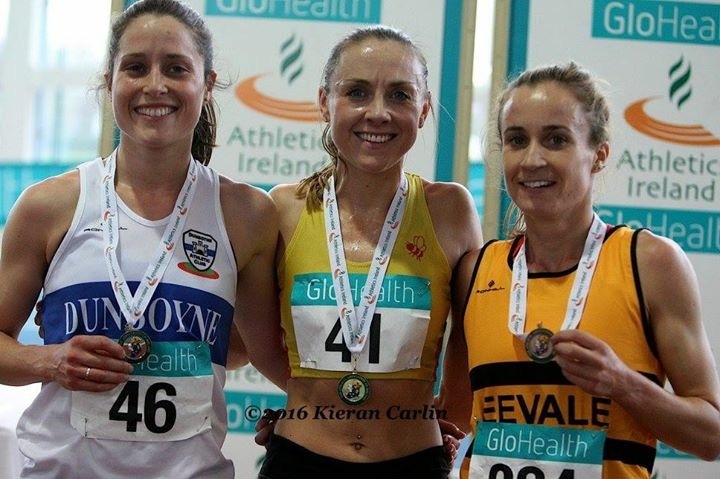 I was happy with the performance, we all want to win, but finishing 8th was a good result that evening with the fast 1500m in the legs from the night before, plus I ran 4 seconds inside my personal best for Armagh (9:24 – 6 seconds behind winner fellow Irish Steeplechaser Sara Treacy). Never before had I been able to string two races back to back like that and run two strong fast races, so the confidence was fully restored and ready for Nationals. 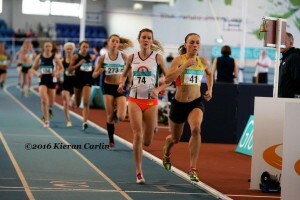 9 days later Nationals weekend arrived and I was entered for both 1500m and 3000m. 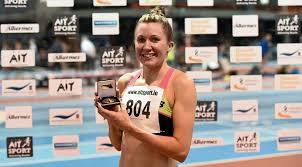 The 3000m was first and it was my main target but coach Rodgers and I had decided to double up again. 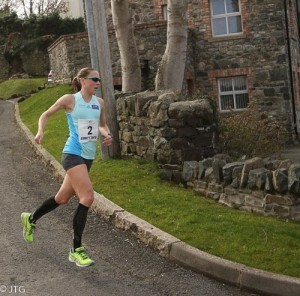 I was determined to run faster than Cardiff and make sure I finished with a smile on my face. It was to be a tough race as it was the first time since Letterkenny (were we had run the Steeplechase Olympic Qualifying Time) that Michelle, Sara and I raced each other on the track. 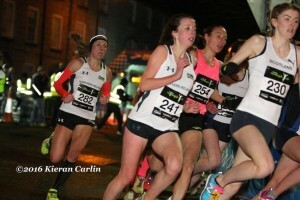 It was billed to be an exciting race with a few other top contenders in there including Anne Marie McGlynn and Orla Drumm. As the gun went Sara hit the front with Michelle and I slotted into second and third place. The pace was good, we went through the first km in 3:07, a second slower than in Cardiff. The second km had slowed a little and we hit 6:16 (identical to Cardiff). It was time to move and I hit the front and Michelle made a move to go as well with Sara responding and going back into the lead. We had to run round a few girls so I stood my ground until we were clear in the home straight, 4 laps to go and I hit the front again and pushed the pace on. I was feeling strong and didn’t know I was pulling away on each stride. The bell went and the last lap seemed to be over in a flash, I was waiting for my legs to tire a little and slow but they didn’t. 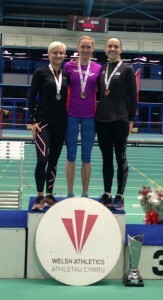 I was so happy to see 9:11 coming over the line, a national title and an indoor personal best by 7 seconds, I was more than chuffed. A 2:55 last km was the fastest I have ever run at the end of a 3000m race, I knew it was fast but hadn’t expected that. The 1500m went to a straight final the following day and once again I was determined to run strongly but wondered when the legs would feel that fast last km from the day before. It was slow and tactical from the start and in hindsight tired legs or not I should have gone hard from the start. 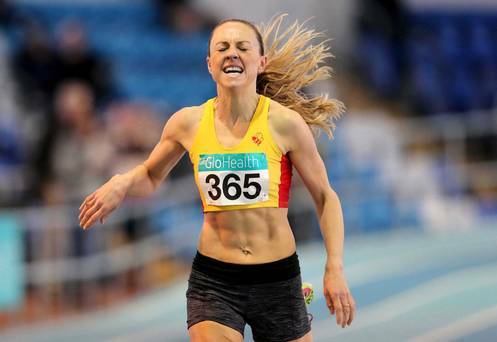 I tried to run hard from 600m out but at 400m to go Claire Tarplee passed me and ran away – I ran a 65 second last 400 to register 4:24 and finish 2nd, one second behind the winner. Again, I had put in two strong races in 24 hours – we hope this will help towards a strong summer. In hindsight as well, we learned a lot from that Cardiff race and the three weeks that followed and the way my physiology responds to certain types of training – all important for the summer ahead. So training so far has been going really well, I have pencilled a few road races in to keep things interesting. My local 10k Road Race, Jimmy’s 10k organised by East Down AC in memory of the great Jimmy Murray, was a great day out and I was delighted that my sponsors McGrady of Downpatrick were there to cheer me on over the route. All being well next month I head away to Font Romeu where I will base myself at altitude for summer preparation. Im really grateful to McGrady’s of Downpatrick for supporting my trip out there.